The Capitol building at sunset in Washington, Nov. 6, 2018. The federal budget deficit continued to rise in the first quarter of fiscal 2019 and is on pace to top $1 trillion for the year, as President Donald Trump’s signature tax cuts continue to reduce corporate tax revenue, data released on Jan. 8, 2019, shows. 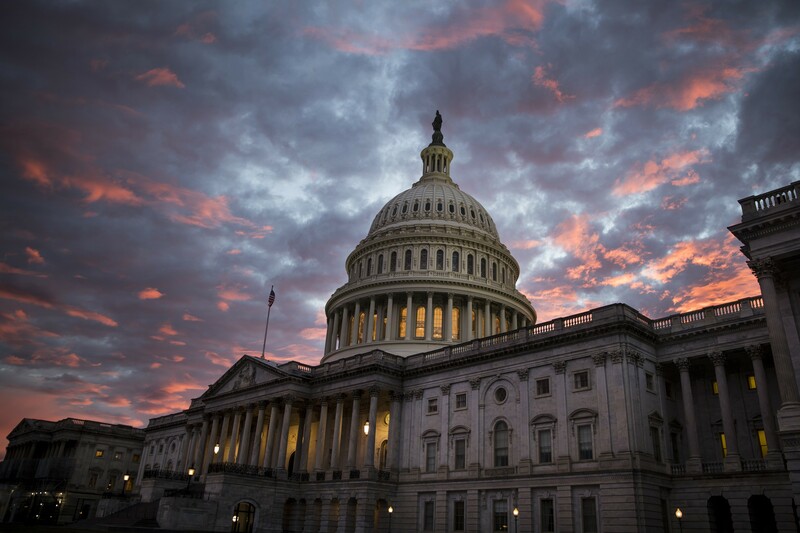 WASHINGTON — The federal budget deficit continued to rise in the first quarter of fiscal 2019 and is on pace to top $1 trillion for the year, as President Donald Trump’s signature tax cuts continue to reduce corporate tax revenue, data released Tuesday shows. The monthly numbers from the Congressional Budget Office also show an increase in spending on federal debt as rising interest rates drive up the cost of the government’s borrowing. The widening deficit comes despite a booming economy and a low unemployment rate that would typically help fill the government’s coffers. Federal spending outpaced revenue by $317 billion over the first three months of the fiscal year, which began in October, the budget office reported. That was 41 percent higher than the same period a year ago, or 17 percent after factoring in payment shifts that made the fiscal 2018 first-quarter deficit appear smaller than it actually was. The report did show one area of increasing revenue — from Trump’s sweeping tariffs. Revenue from levies on imported steel, aluminum and Chinese goods were up $8 billion from the same quarter a year ago, an 83 percent increase. That increase, however, is nowhere close to the levels needed to support Trump’s frequent claims that his tariffs will help pay down the national debt. This fiscal year is the first to fully incorporate the reduced tax rates that Trump signed into law in late 2017, including cuts for individuals and closely held businesses and steep reductions for corporations. Corporate tax receipts fell by $9 billion for the quarter, or 15 percent. Individual receipts fell by $17 billion, or 4 percent. Interest costs on the debt rose by $16 billion for the quarter, or 19 percent. Interest costs for December were up 47 percent from the same month in 2017.